This festive evening kicks off the Holiday Fine Art Show and Artisan Gift Salon and features wine, holiday music, food and the opportunity to purchase unique gifts made by local and regional artists. Paintings are displayed salon style and dozens of artisan crafters present pottery, jewelry, home décor, photography, greeting cards, bags and ornaments for gift giving. 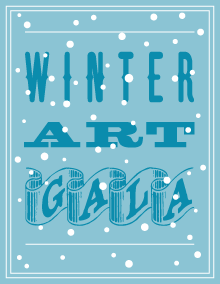 All purchases the evening of the Winter Art Gala are tax-free and proceeds support local artists and the cultural, creative and educational programs of the Mystic Museum of Art. A light supper will be catered by A Thyme to Cook, Coastal Gourmet and Gourmet Galley. All are invited to bring non-perishable food items to donate to the Pawcatuck Neighborhood Food Drive. Reception Tickets: $30 for members through November 11th, $40 for members after November 11th, $40 for non-members.